WHENEVER we think of Native Americans in the United States during the nineteenth century, we naturally think of the decimation of numerous indigenous cultures in America’s quest to dominate the continent (“manifest destiny”). During the same period, however, there were many who realized what unique and rich cultures Native Americans possessed. Artists such as George Catlin saw the dwindling of Indian nations as a tremendous loss to American culture. He sought to document Indian life in an effort to preserve knowledge of Indian cultures for future generations. How do you think your students would depict contemporary Indian life? Born in Pennsylvania, Catlin grew up on farms in New York where he absorbed stories about Indians. Although he began a legal career at his father’s urging, he abandoned it in 1821 to pursue a career as an artist. In 1828, he received the inspiration that guided his painting the rest of his life when he witnessed a visit to Philadelphia by a delegation of Indians from the West. He subsequently decided to devote his life to documenting Indians, whom, he felt, had no biographers of their own. Between 1830 and 1838, Catlin traveled in the West from a base in Saint Louis for five months out of each year, painting the lives of the natives. From his travels, he eventually produced over 600 paintings which he exhibited in his traveling “North American Indian Gallery.” In an effort to reap larger returns from exhibiting and enhance the gallery, improving chances for purchase by the federal government, Catlin issued a lithographic version of his paintings in the “North American Indian Portfolio,” published in London in 1844. In addition to customs, costume, and accoutrements, Catlin’s depictions of Indians are an invaluable ethnological resource. Like most of his paintings, the composition of this work focuses attention on the main subject, often with little or no background depicted. The figure is presented in a romantic-realist style that was popular at the time. The pose is based somewhat on classical antiquity, in keeping with the romantic notion of Native Americans as noble yet tragic figures. The Iowas were removed from their lands east of the Mississippi in 1830 and forced onto a reservation in present-day Nebraska. 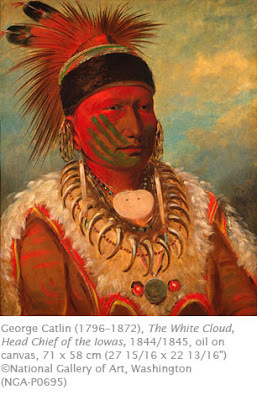 The National Gallery in Washington has over 300 paintings of Indians by Catlin. Students can learn more about the work of George Catlin with the Smithsonian’s Campfire Stories with George Catlin website.